On May 21st, the University of Texas MD Anderson Cancer Center‘s A Conversation With a Living Legend honored former Secretary of State Condoleezza Rice. Last month, when BioNews Texas reported on the announcement of the event, the dinner had already raised $905,000. With 930 guests gathered at the Westin Galleria at the recent event, the proceeds for the events rose to $1,031,000, significantly surpassing last year’s fundraising totals. The donated money will go to MD Anderson’s Moon Shots Program, an unprecedented effort to reduce cancer deaths and to transform cancer care. The last count for the amount “A Conversation With a Living Legend” series had raised to date was approximately $2.5 million. Now, the dinner event with Rice has added more than a million to that total, which now stands at $3,528,000 for MD Anderson research and patient care initiatives. During a sold-out dinner program, Brit Hume of Fox News Channel interviewed Rice, talking about a variety of topics that ranged from Russia’s president Vladimir Putin to the 2012 atrack on the U.S. Consulate in Benghazi, Libya. In addition to the onstage Rice-Hume conversation, the program included remarks by Ron DePinho, president of MD Anderson, and Christopher Logothetis, chair and professor of Genitourinary Medical Oncology, and co-chair of the Prostate Cancer Moon Shot — the specific program that will be supported by the fundraising effort. Cyvia and Melvyn Wolff, members of the MD Anderson Cancer Center Board of Visitors, were the chairs of the seventh annual Houston event, alongside co-chairs Kelli Kickerillo and Todd Forester, who will lead next year’s event. Honorary chairs were Vicky and Harris Pappas, who chaired the 2013 Living Legend event honoring Emmitt Smith. 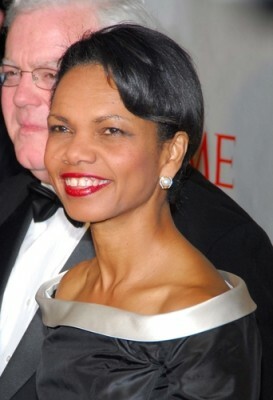 Rice, who served as the 66th U.S. Secretary of State from 2005 to 2009, is the second woman and first African-American to hold the post. Currently a professor of political economy in the Graduate School of Business and of political science at Stanford University, she was also the first woman to hold the position of assistant to the president for national security affairs, under President George W. Bush, from 2001 to 2005.